Bohdan Chomenko / Zvuk Bazaar are a trio or quartet of accordion, violin, guitar and double bass (when a quartet). They specialise in traditional music from Eastern Europe (Ukraine, Hungary, Romania, Gypsy and Klezmer music), and in 1930s Swing Jazz, in the Grapelli-Reinhardt style. Zvuk Bazaar were formed in 1992, and have since gone from strength to strength, performing at venues all across Britain and abroad. They have performed at numerous festivals, including WOMAD, Aberdeen’s ‘Rootin Aboot’ (in association with a live BBC radio broadcast), Crawley, Stockton-on-Tees and the Rochester Sweeps Festival. They have played at various Arts Centres, and larger venues, such as the South Bank Centre and the Barbican. Most recently, they performed at the Gypsy Jazz Guitar Festival, the Greenwich Festival and at the opening celebrations of the Millennium Bridge in London. Bohdan Chomenko (accordion, vocals) was born in 1962 of Ukrainian parents and has been immersed in Eastern European culture since an early age. 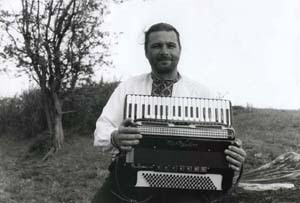 He has played with various Ukrainian folk ensembles, including, notably, the Black Sea Cossacks. He has made both radio and television appearances, and has worked with orchestras, English folk groups and in shows, such as Cabaret and Fiddler on the Roof. Bohdan also performs solo, especially in the French Café style, and does Special Education Needs music workshops. Piotr Jordan (violin) was born in 1969 in Poland, and studied at the Warsaw Conservatory. Whilst still in Poland, he played with the Warsaw and Lodz Opera House orchestras. He lived in Prague for several years and has performed throughout Europe. He plays in a variety of styles, from classical and traditional Irish music, to country and klezmer. Piotr is also employed as a violin tutor for the East London Late Starters Orchestra. Jez Cook (guitar) was born in 1962, and is well known as a Gypsy Jazz guitarist, appearing at the Edinburgh Festival and twice at the Django Reinhardt Festival at Samois-sur-Seine, in France. During twenty years of playing, he has performed with numerous artists, including John Etheridge, Graham Collier, Lillian Boutte, Diz Disley, Gary Potter, Jim Mullen, The Kimbara Brothers, Tziganarama, and Ian Cruickshank’s Gypsy Jazz. He has also performed for George Harrison, Jools Holland, Tony Blair, Prince Charles and Princess Diana. Andy Crowdy (double bass, balalaika) was born in 1961. He is a well-known and much sought-after musician, and, like Jez, has played at the Django Reinhardt Festival at Samois-sur-Seine. Andy has played with numerous artists, orchestras and jazz groups and has made several radio broadcasts. Most recently, he performed with Lillian Boutte in New Orleans. Zvuk Bazaar are best heard as a quartet, although they do also perform as a trio or a duo, as the occasion requires.